#GerardButler in #Geostorm Now Brewing in 2017 But What Does It All Mean? I’m sensing it’s the end of an era. You know I work really hard at keeping the faith, keeping the torch of Gerard Butler’s career lit (for all the thanks I get from him), but I have no idea what to make of this newest development. We’ve gone from a possible three films in 2015, to no films in 2015. Three films in the can. All three have now been pushed back from their original release dates. London Has Fallen, the sequel to 2013’s surprise hit Olympus Has Fallen and the closest thing to a safe bet among the three, will, as of this writing at least, be released in January 22, 2016, pushed back from October 2015. I’ve already complained about the fact that the October 2 date was given to what will surely be an execrable remake of 80’s “classic” Point Break (sorry Edgar Ramirez, but I don’t think even you’ll be able to save it). The reason supposedly had something to do with a crowded fall schedule. The original date would have pitted the film, by a director, Babak Najafi, making his English language debut, against Victor Frankenstein with James McAvoy and Daniel Radcliffe and Robert Zemeckis’ The Walk with Joseph Gordon Levitt, among others. No reason has been given for this latest move. It’s been deduced that it is to give Devlin (who is also at work on his TNT series “The Librarians”) more time in post-production (where it’s been since March 2015). So it was originally going to be a year and a half from wrap to release, now it’ll be closer to two years. The same can be said of Gods of Egypt, which when into post in July 2014. Both films are ultra- special effects heavy extravaganzas. The latter takes place almost entirely in front of a green screen. I actually don’t think this will be the final move for Geostorm. Giving Devlin a few more months to tinker is one thing, but the new date is already crowded with the likes of the Magnificent Seven remake, DreamWorks Animation’s Boss Baby, the LONG gestating version of Stephen King’s The Dark Tower (which hasn’t even filmed yet) and the latest Power Rangers reboot. Regardless of what I think of those films, it’s likely that at least one of them will share ticket buyers with Geostorm. So we’ll see. While all of this may be out of Gerard Butler’s control, probably yet another reason he’s taken to producing his own films (and he only has a hand in one of these, London Has Fallen), he’s been out of the movie-going public’s eye since October 2013. That’s a Hollywood lifetime. I think this was the point. I’d like to believe that even he had tired of the carnival that is his life. While no one has more fun, in terms of his career, it was time to take a step back and reassess. Or at least that’s what I want to believe. While I know it hasn’t all been endless vacations in between Hugo Boss campaigns, none of these three films add up to what I believe is his own (well-deserved) version of a McConaissance. I sincerely hope I’m wrong, but they appear, at first blush, to be more of the same. Perhaps his manager/producing partner Alan Siegel knew of where he spoke when, quite a few years ago, he said (and I’m paraphrasing) that eventually Gerard Butler will disappear completely from in front of the camera and reemerge behind it. Perhaps that’s where he’ll find true creative fulfillment. 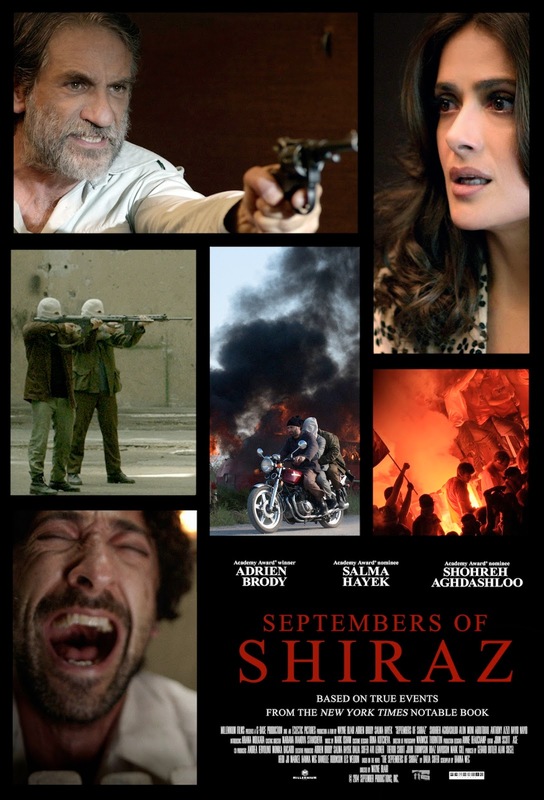 Butler will likely be in Toronto this month to attend the Gala premiere of Septembers of Shiraz, during the Toronto International Film Festival. It is the first film he’s shepherded as producer from the purchase of the book’s film rights all the way to the screen, and the first that doesn’t have him in it. It stars the other half of my favorite bromance, Adrien Brody, as well as Salma Hayek and Shohreh Aghdashloo. The film, directed by Wayne Blair (The Sapphires) and based on the novel by Dalia Sofer, is the true story of a secular Jewish family and the unexpected journey they face during post-revolutionary Iran. The clip features Farnez Amin (Hayek), pleading for details on the whereabouts of her husband (Brody), who was taken into custody and accused of espionage. “It’s time you understood, sister Amin, that the times when people like you could demand things from us are over. Now, it is our turn,” forewarns Mohsen (Alon Aboutboul). I don’t predict huge box office in the US after its as yet to be determined and probably limited release, but it’ll likely have legs overseas and I have no doubt tireless promoter Butler will hand carry it across the globe if need be. My point, if I have one, is that as the time between films in which Gerard Butler appears on our screens grows longer and longer, and some might well wonder if by the time these films are finally released anyone will still care, we might also ask, will he? This entry was posted in "the Biz", author, film clips, Film Festivals, Gerard Butler, movie news, movie posters, movies, Musings, novels to film, S. A. Young and tagged adrien brody, Alex Proyas, Dean Devlin, Geostorm, gerard butler, Gods of Egypt, London Has Fallen, Salma Hayek, Septembers of Shiraz, tiff, toronto international film festival, Wayne Blair. Bookmark the permalink.